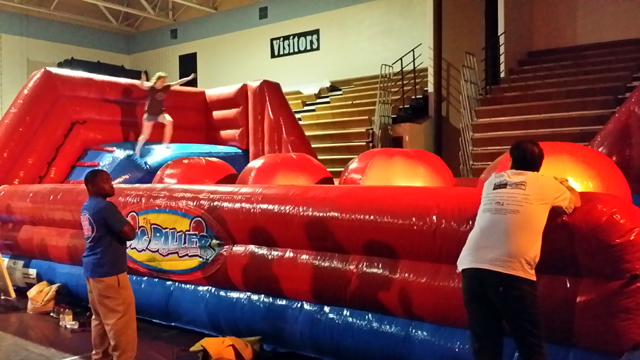 Rent The Big Baller inflatable interactive game for corporate outings, company picnics, college events, university events, high school after prom post prom all night grad parties, elementary school carnivals and other events. Call Talk of the Town 301-738-9500 to book this exciting new ride! The Big Baller - Have you ever wanted to try your skill at the big balls course on your favorite TV show? With The Big Baller interactive course you now have your chance! Participants climb up the ladder on one of the side platforms, then try to cross the course by jumping or running across the four giant red balls. But don't worry if you fall, as the ball pit has a soft cushion base. So challenge your friends to The Big Baller - then wipeout your competition! Includes: inflatable game, 2 blower, and 1 attendant. Great for ages 10 & up.